The rich mineral content of the soil, intense sunlight, Colorado River water and cool nights are just a few elements that make the Colorado wine country’s growing conditions exceptional. The buttes & mesas surrounding Grande River Vineyards radiate warmth down to the vines to ripen the crop to perfection in late August through October and protect the vines from severe winter freezes and spring frosts. Grande River Vineyards, the fifth licensed winery in the state, planted its first grapes in 1987 and fermented its first wine in 1990. 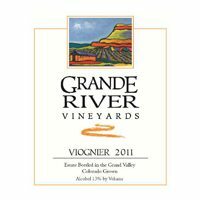 Until 2006 Grande River Vineyards was Colorado’s largest grape producer. By 2006, grape growing was firmly established in the Palisade area. Grande River Vineyards owners, Steve and Naomi Smith, decided to downsize the farming operation and sell most of the vineyards to local fruit growers and concentrate on making great wine. The Smiths kept 10 acres of their original operation with about five acres of Merlot and Petit Verdot and lease back and farm about five acres of Syrah and Viognier. Today, the winery is one of more than 100 Colorado wineries and produces 5,000 cases of wine per year. Founder Stephen Smith and his wife Naomi operate this winery which began with grapes planted in 1987. Our wines have won over 300 competitions. Just off I-70 exit 42. Join us for our concert series and special events. Located south off I-70 at exit 42, driveway is under big sign. From Hwy 6, 1 mile north on Elberta Ave.
Just east of Wine Country Inn.